San Diego, California. 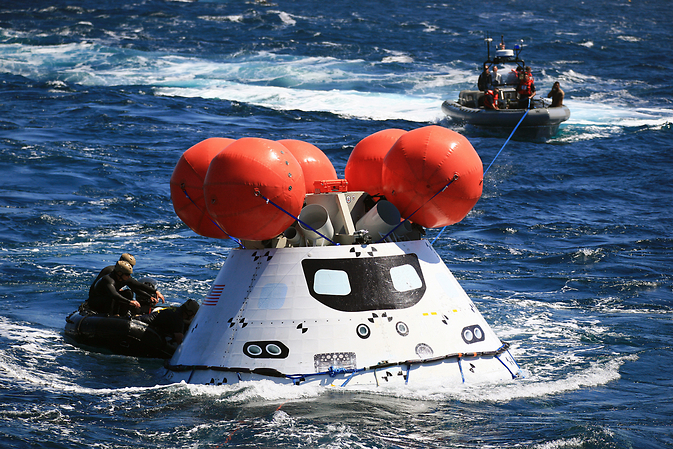 September 25, 2014 – NASA, Orion prime contractor Lockheed Martin and the U.S. Navy successfully completed the third round of tests to practice recovering Orion when it splashes down off the coast of San Diego at the end of its December flight test. The mid-September test series, led by NASA’s Ground Systems Development and Operations (GSDO) Program, continued to perfect techniques and ensure the full team and all equipment are ready when Orion returns to Earth after traveling more than 3,600 miles in altitude away from the planet. Two Navy ships, a test version of Orion, several support boats, two helicopters and associated hardware and equipment were used for the tests. The teams practiced two methods for recovering Orion. The first test began September11 at Naval Base San Diego, with loading of the test vehicle, equipment and hardware aboard the USNS Salvor (T-ARS 52), a safeguard-class rescue and salvage ship. Also on board were Navy radiomen and a civilian crew. USS Salvor headed out to sea September 12 to test a backup recovery method using the ship’s stationary crane . The team started in calm seas and used the 40-ton aft boom crane to retrieve the 20,000 pound Orion test vehicle from the water. They continued recovery efforts in more challenging waters to determine recommended weather and sea condition limits for crane recovery. During this test, Navy divers practiced attaching a “horse collar” around Orion and four tending lines that helped control lateral and longitudinal motion during crane recovery. The team also evaluated a basket lift rigging, consisting of 10 slings that were placed around Orion during crane lift operations. Tether lines from the ship were attached to Orion for towing tests at various speeds and can be used to bring the capsule to calmer waters for recovery. On September 15, the USS Salvor rendezvoused with the USS Anchorage in the open sea to hand off the Orion test vehicle. During testing on the USS Anchorage, the team conducted a full dress rehearsal for Orion recovery. The end-to-end recovery simulation included the ship’s well deck, two of the Navy’s Zodiac boats, four rigid hull inflatable boats, two helicopters and equipment and procedures that were used during August testing. U.S. Navy divers in Zodiac boats and other team members in rigid hull inflatable boats were stationed in the water near the test vehicle. Orange stabilizers on the top of the test vehicle were inflated to simulate the system that will be used to upright Orion in the water after splashdown. Using tether lines attached to the test vehicle, the team guided Orion back to the ship. In the well deck, NASA and Lockheed Martin workers set up a capture net, crew module recovery cradle, wing well fenders, speed bumps, and used a recovery winch, horse collar and Kevlar tending lines to stabilize Orion in the well deck. Other goals of the test were to assess on-ship communications and ship-to-shore communications, as well as recording timing data for recovery activities to help provide future recovery methods for crewed missions. The USS Anchorage returned to Naval Base San Diego on September 19. The Orion test vehicle and recovery equipment were offloaded from the ship. The recovery tests are led by the Ground Systems Development and Operations Program at NASA’s Kennedy Space Center in Florida.